Золотая ручка: дамская литература XVIII-XIX вв. Pelegeja Ivanovna Vel'jaseva-Volynceva (1773-1810) was 18 years younger than her accomplished sister Anna and thus, though she, too, managed to publish her first translation at age 9, it appeared only in the 1780s. While we have no information about their mother – or perhaps they had two different mothers? – these two sisters and their younger brother Dmitrij certainly enjoyed a domestic climate that was conducive to literary activity. As Golicyn notes, Pelageja published two translations, both of them theatrical and featuring her name squarely on the cover. Both were issued by Nikolaj Novikov at the University of Moscow Press, the first was even printed at his expense (Svodnyj katalog 1:130). Novikov supported a number of women writers and translators during his years at the press, bringing to Russian readers ten translations by five different female translators (Rosslyn 143); at least nine of them from French original or intermediate texts. 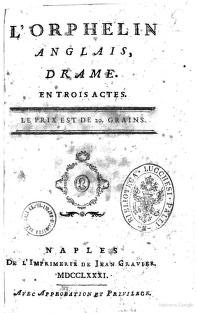 Pelageja's first publication, entitled Французы в Лондоне (The French in London, 1782), was the translation in Russian of Boissy's one-act comedy Le François à Londres (1727), a play criticizing Francomania (Rosslyn 143). Pelageja dedicated her translation to lady-in-waiting (статс-дама) Anna Rodionovna Černyševa, an act that demonstrates her connection to the patronage network of elite court circles insofar as such dedications required permission; in this as well she followed the path of her sister Anna, who had dedicated her translation of Frederick the Great to Empress Catherine (Rosslyn 131-32). 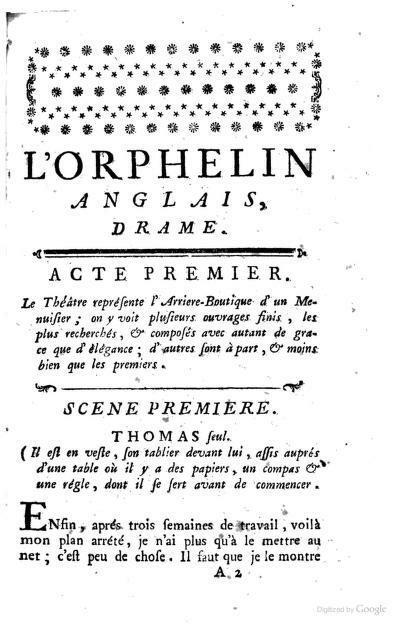 Pelageja's more ambitious second translation took Longueil’s three-act L’Orphelin anglais (1769), which "argues for the primacy of virtuous behavior over class" (Rosslyn 81), and transformed it into a briefer Аглийская сирота (The English Orphan, 1787), apparently making cuts on the basis of how Longeuil's text was actually performed (Levin in Rosslyn 105). Prince Aleksej Golicyn had already translated Longeuil's play, published it in 1775 at the same Moscow press, and seen it performed at the Moscow theater (Zaborov). Did Pelageja choose this same text for translation because she had been inspired by Golicyn's success and/or because she hoped to better his effort? Her slightly different and more effective handling of the title suggests that there might indeed have been some room for improvement: while Golicyn's title, АглийскОЙ сирота, does not specify the gender of the orphan in question, Pelageja retouches the adjective (АглийскАЯ) to indicate that the play's forlorn protagonist is of female gender. Pelageja's translations for theater were not actually staged, only "read with pleasure", avers Michail Makarov in his survey of women's writing (149), although another source reports that her version of The English Orphan did in fact go on the boards at Pëtr Sheremet'ev's renowned serf theater (Elizarova in Rosslyn 154). Like Anna, Pelageja seems to have abandoned translation more or less at the time of her marriage. On that later part of her life, literary scholars have offered little more than that she was wedded to a certain "colonel Annenkov" (Belych, Kočetkova). After sifting through a number of genealogical materials online, however, we can add a surprising twist to this terse datum – and a series of important genealogical discoveries. As it turns out, Pelageja married a colonel named Nikolaj Nikanorovič Annenkov (1764-1839). The revelation of this missing link in accounts of her subsequent life and legacy allows us to see that Pelageja went on to further the tradition of writing –and women's writing – that had been established in the Vel'jašev-Volyncev home by nurturing literary interests in her three children, Varvara, Ivan, and Nikolaj. Indeed, Pelageja's daughter is the same Varvara Nikolaevna Annenkova (1795-1870), who later became a well-known poet. We can thus now link two generations of women writers – and also identify Pelageja as the maternal figure, who has been missing from descriptions of Varvara's upbringing (e.g. Kachmarchik): these name only Varvara's father and not the literary mother who managed, before her own early death in 1810, to set her daughter upon the road towards poetry. Varvara Annenkova merits a separate post, of course. Unlike her mother and aunt, she never married and began publishing relatively late in life, only in her forties, but she resembled her forebears in "assiduousness". A close friend and literary associate of Mikhail Lermontov, Annenkova wrote numerous poems, a verse fairy tale, and the four-act verse drama "Charlotte Corday" (1866) that capped a century of women's writing in the Vel'jašev-Volyncev family. Students interested in Pelageja Vel'jašev-Volyncev might compare her translations with their French source texts, or her translation of L’Orphelin anglais with Aleksej Golicyn's version of the same, but such projects require access to libraries housing rare Russian books. Another approach to her legacy might be to examine the work of Varvara Annenkova, much of which is available online, for any ideas on translation or other suggestions of a literary connection to her mother. Or perhaps Annenkova's texts can be linked thematically to those of other members of the Vel'jašev-Volyncev clan, such as her aunt, uncle, and brothers? Belych, N. N. and N. D. Kočetkova, "Pelageja Ivanovna Vel'jaševa-Volynceva" in: Slovar' russkich pisatelej XVIII veka, vol. 1 (L.: IRLI, Puškinskij dom, 1988). Kachmarchik, L. "Varvara Nikolaevna Annenkova," in Dictionary of Russian Women Writers, ed. Marina Ledkovsky, Charlotte Rosenthal, Mary Zirin (Westport, Conn.: Greenwood Press, 1994), 29-30. Makarov, M. N. "Pelegeja Ivanovna Vel’jaševa-Volynceva", in "Materialy dlja istorii ruskich ženščin-avtorov." In Damskij žurnal (1830), no. 10, ch. 29, 149. Rosslyn, Wendy. Feats of Agreeable Usefulness: Translations by Russian Women 1763-1825. Fichtenwalde: Verlag F. K. Goepfert, 2000. Šichovcev, Evgenij. "Bessmertnyj Buassi", online at Mir, reki, vremeni (consulted 26 May 2017). Svodnyj katalog russkoj knigi graždanskoj pečati XVIII veka, 1725-1800 (M.: Izd. Gos. Biblioteki SSSR im. Lenina, 1962), vol. 1, 129-30; vol. 2, 177. "Genealogičeskaja baza znanij: persony, familii, chronika", online at: Vserossijskoe Genealogičeskoe Drevo. Zaborov, P. R. "Aleksej Petrovič Golicyn", in Slovar' russkich pisatelej XVIII veka, vol. 1 (L.: IRLI, Puškinskij dom, 1988). 1, 2. 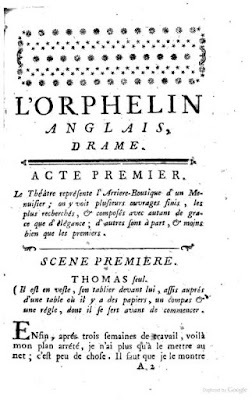 Cover and title page from Longueil’s L’Orphelin anglais (Naples, 1781). 3. Painting of Charlotte Corday by Jean-Jacques Hauer (1751-1829). This blog and the translations presented on it are licensed under a Creative Commons Attribution-NonCommercial 4.0 International License. The work posted here has been generously provided by persons unpaid for their labor and may be reproduced for scholarly or personal use, but not for commercial purposes. When you quote from or otherwise cite this blog or the translations featured here, please include the name of the site, "Zolotaja ručka: Damskaja literatura XVIII - XIX vv. ", and that of the translator or author. We would be delighted to receive your feedback whether in response to specific posts or to the site in general. We also welcome proposals from potential contributors for translations of Russian women's writing into Italian or English. You may leave comments at the end of our posts or contact us by email at: zolotaja.rucka@gmail.com. Welcome to "Zolotaja ručka: Damskaja literatura XVIII-XIX vv." While the Editorial Commissariat has examined the translations posted here and made minor suggestions, responsibility for their overall quality -- as well as the guarantee that they represent original work -- lies wholly with the translator and not with this blog or with its editors.